Art Fund are launching a scheme called Student Art Pass, allowing any full-time higher education student to engage with art and culture. Explore world-class museums all over the UK and enjoy a year of endless inspiration with friends, for your studies, or just for you. From the V&A and British Museum to Cardiff Castle and Jupiter Artland, a Student Art Pass brings you free access to over 240 museums, galleries and historic houses, and 50% off major exhibitions. Student Art Pass membership costs £5 a year and includes access to recommendations on what to see, creative competitions and paid opportunities in the arts. 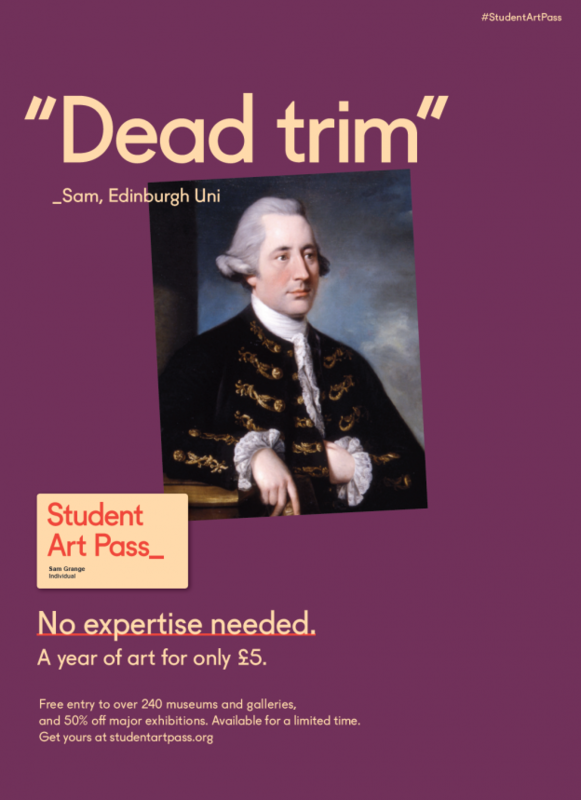 The Student Art Pass is available for £5 for a limited time (until 9 December) to all full-time students, get yours here. This entry was posted in Medway Student, Student Guide and tagged Canterbury, Medway, Student Guide on 12 September 2018 by Sophia Cheraitia.